No, I’m afraid the nightmare may have just began. Yeah, that was kinda the joke. Out of the frying pan and into the fire it would seem. Who is this Murphy transatlanteans keep referring to? So clearly the battle went very well for the Guildies. We have the same gravatar right now, i think. Don’t be afraid. I promise you won’t be hurt. Have you ever heard the term “homunculus”? 1. HR–sorry, Brother Homon–and Brother Tom will simply attempt to kill Byron in the usual sort of stabby/choppy way. 2. Homon will remind Byron of his Sepia World identity and thus kill the “character” that way. 3. Homon will do that and then, back in Sepia World as HR, kill Tube!Byron, just for good measure. Repeat with the other Four. 4. Something far less obvious than I’m able to think of at this point. Now I feel dumb. Thanks. Magic soul-sucking rituals aren’t really that much less obvious. I doubt #1 will happen. If he just wanted to stab him, he could of done that while Byron was unconscious. Unless that is, the bad guys were tutored by Dr. Evil. Byron: “What do you what?” Homon:” We want . . . *Homon puts his pinky to his mouth and have a dramatic close up* you to die. Have we seen HR as “Brother Homon” before? Because. That looks an awful lot like just HR. The tags under the comic are an excellent way to answer this question! Tom- Wait just a moment, there, Homon, did you just say ‘resurrected’? Okay… nothing good happened if you wake up tied to a freaking stone alter! Oh I dunno, depends on who I wake up WITH on the stone altar. Only if I have an urge to fight Britons. Opps replied to the wrong comment, that was to Oldguy. Yes, but tell me more about Asian Mab. That wasn’t my first thought, but props for the C.S. Lewis reference! Suddenly your old friends Iolo, Dupre and Shamino appear. Iolo and Dupre hold off the cultists while Shamino cuts your bonds, and grabs a stone tablet the head cultist was holding as the four of you dive back through the moongate. I’m just surprised I remembered their names. It’s been God-I’m-old years since I played that game. Then Byron flips them off as they dive through, loses two or three eighths for taunting, and has to grind good deeds for another hour. That hot air balloon quest got pretty involved. I’ll remember THAT until I’m 90. I actually looked that intro up on youtube for nostalgia after reading that comment. Good times. I think I have that game in the original box somewhere still. And now the plot should hopefully take a major leap forward. Homon’s eyes are weirdly small. Or, rather, they’re not weirdly large like everyone else’s. He looks more like a real person, it makes him uncanny. He should’ve made a lore-friendly avatar instead of installing all those mods. There’s only so much processing power the game can allocate per face. Homon just changed the code so that all the eye graphics were redirected to his ‘tash. His mustache is using up his total allocation of polygons. I think it’s the lack of glasses. And yeah, he is creepily “realistic.” I didn’t notice that at first. An astute observation, LockeZ. It is true that Homon looks different from the other characters in Arkerra. You may recall that Homon entered Arkerra from Sepia World through a portal created by H.R. Thus, Homon’s presence in the game is by an entirely different manner than the other characters. In other words, Homon is not a creation of, nor being generated by, the “game programming” and yet is still interacting with it. spooky, huh? I was also going to comment on this. I really like the distinction. 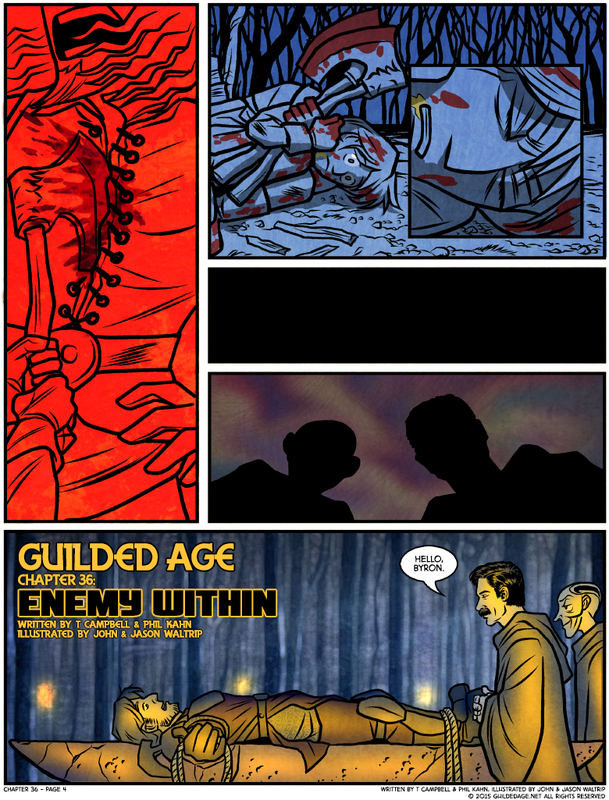 Next, on Guilded Age: We cut to another scene, and don’t see Byron again for four months. Byron is totally freaked out by Brother Homon’s strange hairstyle. I wonder if we’ll find out who raised Baby Byron (is that official now?) since he is said to be the only survivor of Battleshire. What exactly do you do if you find yourself about what, 13?, alone, and wandering around talking to a couple of bloody axes? It kind of dampens your prospects for getting taken in…except by Cultists, perhaps. And then cut away back to our other Guildies for another seven updates or so with this cliffhanger never getting resolved until then. Sometimes we write “for” the website updates. Sometimes we write “for” the books/archive. It depends on what we require getting out of the scene. Oh would you look at that I missed Locke saying it first, whoops. But in all honesty I know you guys wouldn’t jerk us around like that for no reason. You haven’t let me down yet, and I don’t expect ya to. I’ve always been curious about how you webcomics folks organize for a medium that is originally online and released and segments but then gets packaged and sold as one work. A great example will be the way that 2014 and 2015 will be completely different experiences for the Guilded Age reader: last year I saw the story advancing five days a week and the universe expand a little on the sixth. To me that made it feel like we were taking our time to explore the Arkerra, almost like you would in a video game where you’re in between main quest events. I’m only guessing of course, but 2015 already seems like it may be a little more cinematic: here we are with a confrontation between the Big Bad and one of the Heroes in a chapter that promises to answer some of our biggest questions, like this is the main action in a universe that is mostly implied. And knowing that I only see these events three times a week adds some suspense, like in foreign cinema where the shots are generally longer. Obviously obviously extrapolating based on like four days of comics, but the slower update schedule may re-focus our attention. But all of that will probably be lost in print! That’s what’s exciting to me, because it’s a completely unintentional but unavoidable effect of the conversion. We are, right now, participating in a communal art experience that no one else will ever have in exactly the same way. And that’s awesome. (Art geek rant over, you should still buy the books as they come out). I mean, I was just being snarky. I don’t mind if you actually do that, I just predicted it because I knew it would rile up the other readers to realize how likely a development it was. I get it. Pacing a story well makes the best parts even more satisfying. Despite any personal gripes I might have from time to time about certain aspects of Starbucks World, I trust you guys to do it right more than I trust almost any other authors of any medium of fiction, because you’ve earned that level of trust. At last we meet for the first time for the last time. I think it was either this chapter or the next one that I originally left off on. I’ll find out soon enough that’s for sure. We’re the last two chapter titles really Xcom references?